With a legacy that has carried him from freedom fighter to Israeli Prime Minister to recipient of the Nobel Peace Prize, Shimon Peres is one of the towering figures of the twentieth century. 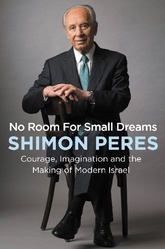 Completed just weeks before his death, here is Peres's majestic and intimate exploration of modern Israel's history and the values that will carry her forward. No Room for Small Dreams spans decades-from the Arab riots in the wake of World War I to Israeli spy operations to its nuclear program; from its controversial wars and peace treaties to today's extremist settlers. In looking back, Peres looks forward, offering a meditation on the sacrifices of making peace, and on the courage necessary to emerge from the shadows of history into a bright future. Shimon Peres (1923-2016) was one of Israel's founding fathers and for more than six decades was an architect of its ascent from a fragile state to a global power. In 1994, he was awarded the Nobel Peace Prize for his efforts to bring peace to Israel and Palestine, and in 1996 he founded the groundbreaking Peres Center for Peace and Innovation.